The Aluminium cable bus (black matted) is fully made of aluminium and produced in highest quality. The functional designed cable bus is made of high quality aluminium. 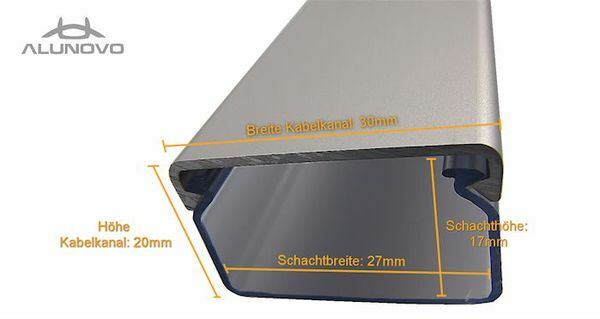 With a height of 20 mm and a width of 30mm, the precious cable bus offers you plenty place to cover your cables (for example for LCD-monitor, plasma displays, TVs, loudspeaker, wall lamp, ceiling lamp systems, wardrobe lighting, painting lighting etc. You can use the cable bus everywhere, where the cables are viewable and disturbing!